Gabe Burrows has been the rodeo coach at Dodge City Community College for a year now, and the Hugoton native is a model of persistence and drive for his team. 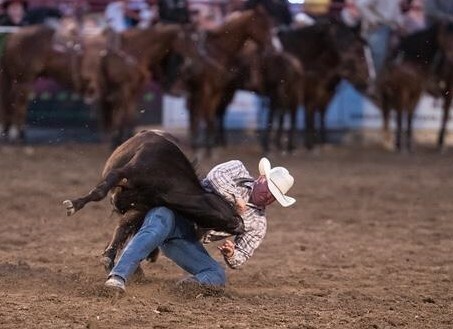 Burrows recently competed at the Redding Pro Rodeo in Redding, Calif., and showed he’s still got the stuff to compete with full-time professionals, taking second place in the first round of steer wrestling and ultimately finishing in fifth place on the aggregate. Burrows won over $2,000 at Redding, which featured hundreds of contestants and more than $170,000 in total purse money. Persistence is a key trait Burrows tries to instill in DC3 rodeo team members. Over the years since earning his “pro card” at just 18, time constraints, family considerations and budget restraints have often limited his professional rodeo career to a part-time basis. Regardless of the obstacles however, Burrows carries on and makes appearances at some of the larger rodeos around the country each year. With his first season at DC3 under his belt, Burrows said next year looks even better. A typical steer weighs at least twice as much as Burrows and other bulldoggers. Horses charging alongside a steer are running at nearly 30 miles an hour. Steer wrestlers essentially perform a controlled fall from atop one tall, sprinting animal onto a slightly shorter sprinting animal – except this one has horns and is mildly panicked. Then in a flurry of hooves and dirt, bulldoggers try to stop the animal and wrestle it to the ground – all in just a few seconds. The raw courage and brute strength necessary to compete at a high level in steer wrestling belie Burrows’ courteous and amiable manner. Rodeo and ranching run in his family’s veins and Burrows learned to rope and ride and wrestle a steer alongside his father Dave growing up in Hugoton. Dave was a steer wrestler himself and often competed professionally throughout the region. Burrows said his father was far more interested in being a family man than living life on the road as a full-time pro, and he settled down and entered events when he could. So his father nurtured Burrows’ talent and love for the sport, while modeling the tenacity to continue pursuing that passion at a high level even if his main focus needed to be elsewhere. “He said do all you can with what you have,” Burrows said. “He would always make sure he was prepared so that he could compete. Even if he was going to go somewhere to compete against the bigger guys. That guidance from Burrows paid off for DC3 rodeo team members this year. Layton Wright won in team roping at the Northwestern Oklahoma State University rodeo, and Wright, Cameron Peterson and Eleanor Moffitt were able to advance into late rounds at large rodeos. The confidence and tenacity helped DC3 rodeo team members perform and finish well despite competing against kids from much larger schools. Burrows said they competed against teams with far more experience from powerhouse, four-year rodeo programs like K-State and Oklahoma. Burrows typically follows the PRCA Prairie Circuit rodeos throughout Kansas, Oklahoma and Nebraska, so committing to enter and travel to California was fulfillment of a prolonged ambition. “I’ve always heard it’s a great rodeo and always wanted to go, so to be able to go and actually do well means a lot,” Burrows said. He expects to enter well over two dozen rodeos during the summer months – including the Dodge City Roundup. At one point in 2013, Burrows was ranked 17th in the world according to the Professional Rodeo Cowboys Association. At the time he was traveling and training with another steer wrestler who knows how to win – Ashland’s Jule Hazen. Hazen would finish the 2013 season ranked 10th in the world with over $100,000 in winnings and is still competing near the top, sponsored by Boot Hill Casino and Resort in Dodge City. Burrows’ father taught him the value of surrounding himself with good people who embody success and worth ethic. Burrows certainly continues to avail himself and the DC3 rodeo team of quality rodeo people, as eight-time PRCA world champion bull rider and ProRodeo Hall of Famer Donnie Gay frequently comes to the DC3 campus to dispense knowledge from his wealth of rodeo experience. Former world champion calf roper Jeff Copenhaver also makes regular appearances at DC3 rodeo team practices. Gleaning knowledge from the experience of others is a hallmark of Burrows’ style and a definite advantage for his students. Coaching as well as actively competing in rodeos provides Burrows with an ever-deepening well from which to draw experiences he can pass along to students. Burrows says he is grateful to have a platform at DC3 and being able to impart some of the wisdom he has garnered from years of rodeo. He sees the competition and coaching as counterparts that help him perform better at both. Burrows was experiencing steady success as he traveled the circuit with Hazen in 2013, but he quickly came off the road to help out the family when his dad got sick with cancer. Burrows said the battle was difficult but his father is now cancer-free, and the experience further solidifies his belief in the value of the rodeo life and kinship. That time-honored work ethic and mental resilience he picked up from family and close friends in the rodeo community is the most important aspect of rodeo he teaches students. “You can have all the talent and practice everything down to minute detail, but if you don’t have your mind right all the other things aren’t going to fall into place for you,” he said.